September 2013 | Pentaflex INC. September 2013 | Pentaflex INC.
At Pentaflex, the most rewarding recognition for us is when our customers are consistently happy with the work we do for them. 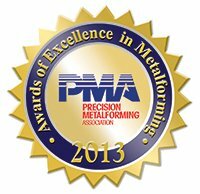 However, when an organization as prestigious in our industry as the Precision Metalforming Association (PMA) officially recognizes our work, and rewards us for it, we are beyond proud and honored. Therefore, we’re thrilled to announce our receipt of two of the eight coveted 2013 Manufacturing Excellence awards by PMA. As PMA is the premier association representing the $113 billion metalforming industry, we are thrilled to accept these great honors, and look forward to continuing to bring the highest level of quality to all of our clients.